There are more than enough horror stories about social workers discovering children who’ve been abused or neglected within the foster care system or—perhaps worse yet—reports of social workers who knew of abuse or neglect and failed to address or report it. The investigations will go on, and the details of these tragedies will be dissected. But is there hope for change, and if so, what important strategies must be implemented? Social Work Today consulted foster care experts and, noting the recurring themes among their varied suggestions, gleaned the following five strategies for change. A strategy experts firmly believe and urge as the first step before proceeding to other options in foster care is the need to strengthen families of origin. “I can’t underscore enough the urgency of getting focused on family work,” says Carol Wilson Spigner, MSW, DSW, the Kenneth L. M. Pray distinguished professor at the University of Pennsylvania School of Social Policy & Practice in Philadelphia and one of 16 individuals who served on the Pew Commission on Children in Foster Care, a nonpartisan group founded in May 2003 to recommend ways to improve outcomes for children in the foster care system. It’s a mistake to separate the development of children from families, notes Tricia B. Bent-Goodley, PhD, MSW, LICSW-C, a professor and the chair of the Macro (Policy, Community, and Administrative Practice) Sequence at the Howard University School of Social Work in Washington, DC. She specifically points to the need to focus on maintaining the family of origin, suggesting that better funding for prevention would be a good start. Prevention has been proven effective, she stresses, even though comparatively foster care and adoption have traditionally been funded at higher rates. 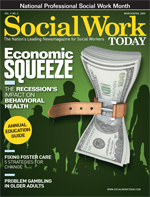 Echoing Bent-Goodley on the funding irony is Sarah B. Greenblatt, ACSW, director of New Haven, CT-headquartered Casey Family Services’ Casey Center for Effective Child Welfare Practice, which is the direct services agency of the Annie E. Casey Foundation. “The way that the federal government has funded services has made it more possible for states to get funding for placement services than for family-strengthening services,” Greenblatt says. “We must help to develop and sustain families who really want their children,” says Bent-Goodley, who coauthored “Meeting the Challenges of Contemporary Foster Care,” an article posted on The Future of Children, a Web site collaboration of The Woodrow Wilson School of Public and International Affairs at Princeton University and The Brookings Institution. Furthermore, Greenblatt draws attention to the legalities of family-preservation matters. She notes that the law requires that every reasonable effort be made to preserve and strengthen a family while solving family problems that put a child at risk. “If a child needs to be placed in foster care, the reasonable-effort mandate is to reunify them in 12 to 15 months,” she says. All social workers who have discussed family preservation and reunification stress that keeping a child in or returning a child to an abusive family situation is never an option. Preservation and reunification should not be pursued at all costs, they note, and are acceptable only when a child’s safety and well-being are ensured. Greenblatt sees promise in strategies that bring nonabusive birth parents to the table and offer them a voice, even when a child does not remain in their care. “States are beginning to work inclusively with families by inviting them to planning meetings, decision-making meetings, and including them in mediation processes to determine who else could care for these children if parents can’t,” she says. “It’s limiting the role of the state, unless there’s absolutely no one else. And when it comes to supervising case work, the experts make a distinction between what’s effective and what isn’t. “What tends to happen,” Bent-Goodley says, “is that supervision is focused on ‘Did you write your progress notes?’” When involved in a case that’s outside his or her area of strength—for example, the legal system—the social worker should be asked what types of support he or she requires, she says. Riley partially blames a fiscally driven mental health care system with inequitable service reimbursement rates. She explains that a less experienced clinician is more likely than an experienced clinician to accept a lower reimbursement. High-profile cases and negative media coverage give social work a bad name, Bent-Goodley says. Noting that the past year has been tough for child welfare in the Washington, DC, area, she says she has seen the lives of social workers turned upside down, even when they have no direct involvement in a particular case. “It’s so hard to encourage students to pursue social work when they can pick up The Washington Post and read the names of people [social workers], even though in the end, they are vindicated by the courts,” she says. One way to help stem negative media coverage is to consult with those who interface with the media, such as public officials and politicians, about what is and is not acceptable to say about a particular case, especially when the case remains under investigation. “We need to start with educating them and getting the rules down about what is appropriate and inappropriate to discuss,” she says. Another way to fight the stigma associated with foster care is to educate the public. Created by C.A.S.E. originally for use with adopted children, the W.I.S.E. Up! Power Book was recently adapted for use by children in foster care. It’s a workbook that empowers children and teens, helps them deal with obtrusive and offensive questions about their situation, and, ultimately, can help questioners develop a greater understanding not only about a particular child but also about foster care in general. Riley points specifically to unresolved grief and loss as a unique mental health care challenge of children in foster care and one that should be addressed by the system as a primary concern. “The kids are separated from their first families, separated from their friends, separated from schools, and separated from communities. They’re placed into new and different settings,” she says. “Nowhere along the journey do we spend time in helping children work through those significant losses in their lives.” She adds that the physical and sexual abuse experienced by some children in foster care is also a type of loss. When children feel anxiety about what’s going to happen to them and who’s going to be there for them—in essence, when they feel they don’t belong—it’s of the utmost importance to guide them in building connections. “Children tend to do better in their well-being—intellectual, emotional, social, health, and mental health—when they have connections,” says Greenblatt. For individuals in foster care to feel connected to the world as they grow into adults, they must first know from where and whom they came. Whenever possible, an open relationship with the family of origin is encouraged so that children know about heredity, genetics, and how they became who they are. “We must make sure that children are not pulled from families unnecessarily and that we don’t cut them off from families just because those families put them into foster care,” Greenblatt says. This connection-building process is an area where children need guidance, Riley cautions. “We must help the child to see it. The child may not have thought of that person as a strong connection,” she says. — Nadine M. Hasenecz is a Bethlehem, PA-based freelance writer.